Removal Companies In Spain - What Boxes Should You Use? Removal companies in Spain will need your help to some extent when it comes to moving abroad. Packing is something you may be tasked with. If you are moving to Spain permanently, then this could mean packing everything you own, and it is important that it is safe in transit. Packing your items correctly is one way to stop any damage from occurring during Spain removals. Although a professional, experienced removals company will also be able to understand exactly how to move your items so as not to cause damage, packing the boxes properly will help immensely. Using the correct boxes is crucial, as anything that is not as high in quality could mean that accidental damage can occur, which is the last thing anyone wants during their removals to Spain. It is best to use the most robust boxes you can find � they should have two-ply walls to make extra sure that they are strong enough to copy with the demands being placed on them. Only fill to the top of the box itself, and don�t overfill so that the top flaps of the box don�t lie flat. If the top of the box is not flat when you tape it up, then it is too full � plus any item on the top could get crushed easily. One tip that removals companies like their customers to employ is to fill a box halfway with heavier items, and then fill the remainder of the box with light items. This means that everything is packed for your move, but no box is too heavy to lift safely. Removal companies in Spain should be able to offer a number of different packages to suit your moving needs. Advance Moves has those packages, plus bespoke options, and more at http://www.advancemoves.com/. 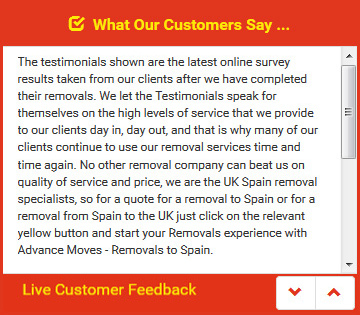 We are experts in removals to Spain, and can be contacted on 0871 218 0612 or info@advancemoves.com.